I do not know what they had in the basement under last night's room*, but it was chucking out enough heat that I slept on top of the covers with the window open and was still too hot. Now they probably think I'm the kind of oaf who gets too drunk even to get into bed. Bah! There's no road out anyway. 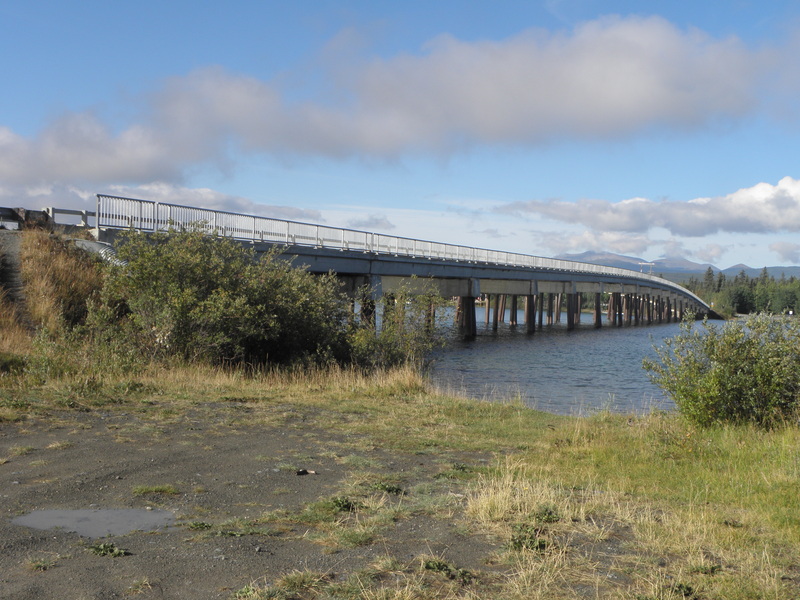 I was hoping for a bridge across the Mighty Yukon too, but subsequent investigations have shewn it to be on the bit of the Alaska Highway I missed. However, I shall find it on the way back south. Hurrah! At Carcross, Highway 2** heads north to the Alaska Highway and south to Skagway, wot is in Alaska but cannot be reached by road without passing through Canada. Same applies to Haines, which is fewer than twenty miles from Skagway on the ferry and 350 miles by road. Skagway is not big but it is a port of call on the Alaska Marine Highway - the ferry route that runs all the way down the coast to Bellingham, not far from Seattle. So there's a good deal of traffic on Highway 2, as indeed there is when the Alaska Highway is rejoined. Because that's at Whitehorse, capital of the Yukon Territory and home to about 25,000 people. 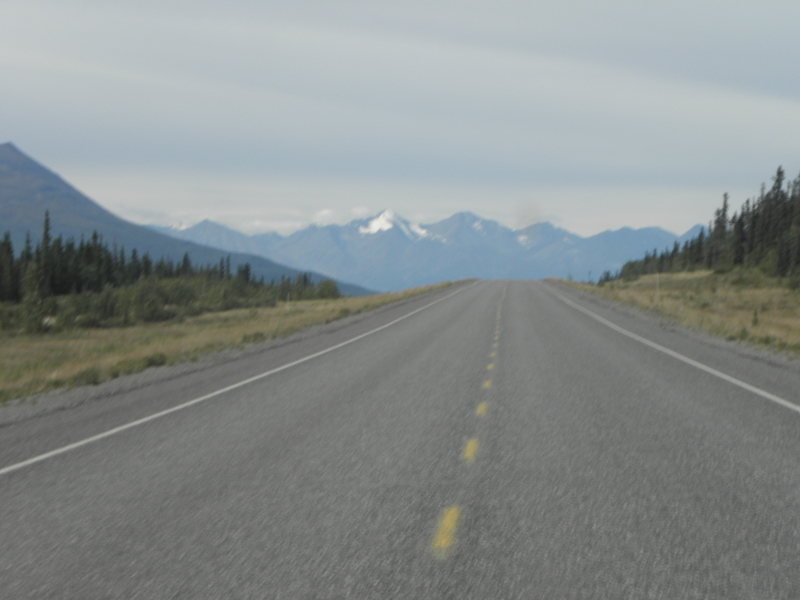 The Alaska Highway bypasses the town but there are still - shock! horror! traffic lights. 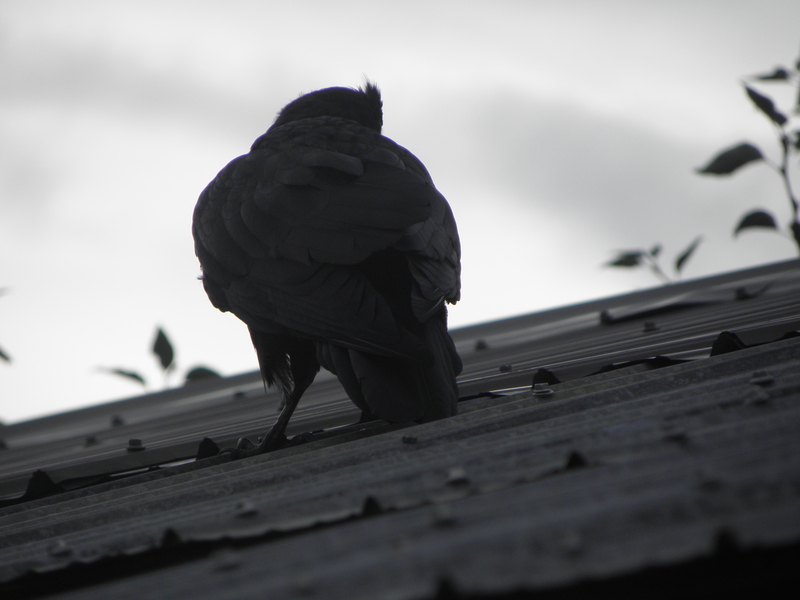 The first, I think, since Fort Nelson. Fortunately this terrible state of affairs is short-lived, as the road goes back into the great bugger-all. Somewhere in that lot is Mount Logan, the highest point in Canada, but I think it's round the back. 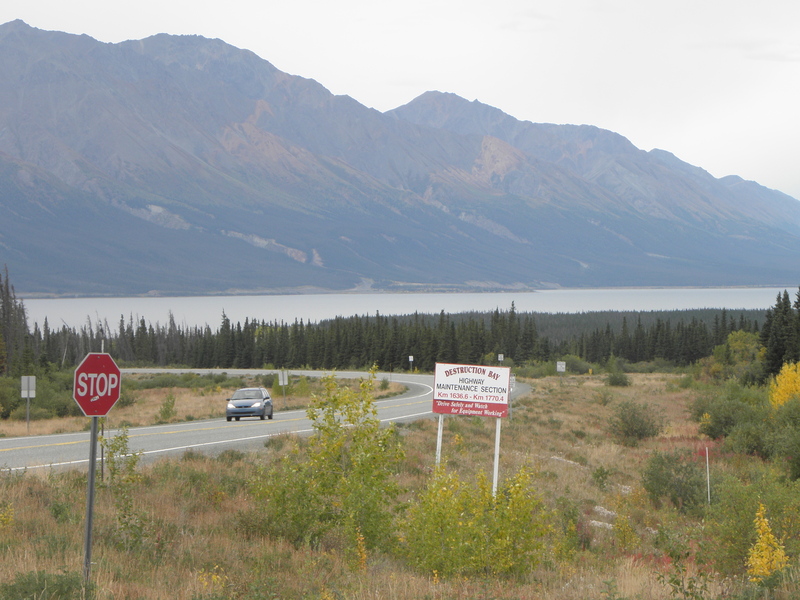 Turn right at Haines Junction to stay on the Alaska Highway and along Kluane Lake for some considerable distance. 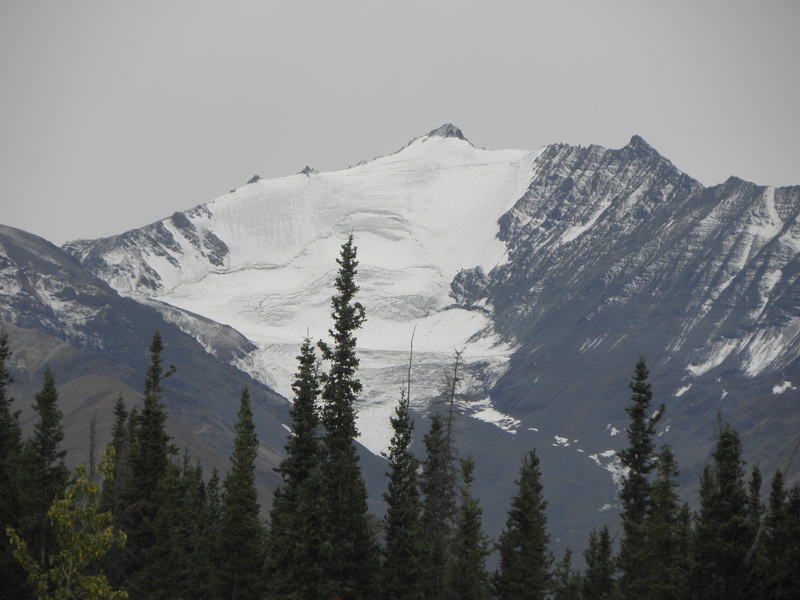 Kluane Lake hav a very interesting history if you are interested in hist. which few boys are. Not that long ago in geological terms - 3-400 years - its outflow went south to the Gulf of Alaska, but then some glacier-related shenanigans blocked that exit causing the water to find an alternative route, ending up in the Mighty Yukon instead. No doubt to the confusion of any salmon who were away at sea when it happened. Just round the corner from here is Soldier's Summit, where the Alaska Highway was officially opened in November 1942. Not sure why they chose here, mind, as the workers from the Alaska end met those coming north at Contact Creek, which is about three corners on from that "Welcome To Yukon" sign pictured yesterday. There are still some triff glaciated mountains on the west side of it. They are digging up quite a lot of the last 40 km to Beaver Creek, though it was after the diggings-up that the pickup in front fired a stout rock at That Shitbox Dodge, putting a large chip in the windscreen, and to add insult to injury he had a pro-Trump sticker on the back of his wanky truck. Anticipating this kind of nonsense in the Far North, however, this Unit forked out extra for the insewerants against such things. Hurrah! * My suspicion is a meth lab. ** Note for Mrs Pingu; at a rest area along Highway 2 I encountered not bingly-bongly goats but a bingly-bongly bicycle!